With the new year quickly approaching, now might be a good time to archive all of your tweets for 2010. You wouldn’t want to lose any of your tweets, or have something happen to your account in 2011 that would cause you to lose a year (or more) worth of tweets, replies, DMs and favorites. Anything could happen and with Twitter accounts being hacked on a daily basis, it’s a smart and safe idea to backup and archive your tweets as often as possible. In case of any emergency, I’m sure that one of the services below is bound to come in handy! Tweetstream not only backs up your tweets, it lets you “preserve all of your important Twitter info and uses the data to make you more efficient, effective and prominent to your followers.” Your tweets will be searchable, customizable and exportable. So, you will be able to download your data to your computer via FTP, Amazon S3, Dropbox (coming soon), PDF (coming soon) and more. Tweetstream has both a free and premium account type. The premium account is normally $25/year, but if you sign up before January 3rd you can get it for only $5/year. You really can’t beat that price. BackupMyTweets lets you archive 3200 (due to Twitter limitations) of your most tweets. The tool also offers daily backups and the ability to search through your tweets. If you’re looking to backup your email, blog or photos, there are tools for that as well (BackupMyMail, BackupMyBlog, Backupmy Pics). BackupMyTweets currently only offers a free account (it’s free as long as you’re willing to let it send out an automatic tweet of your choice from your account). They are, however releasing a Premium Edition in the near future. The price of that will be $9.95/year, but if you pre-order right now you can get it for $4.95/year. TweetBackup is powered by Backupify, a popular service that backups and archives all of your Google apps and various social media data. TweetBackup is free and includes daily backups, exporting and hashtag archiving. Tweetback also has a 3200 tweet limitation, though some users have claimed that they can see more tweets in their archive. The downside to TweetBackup is that there doesn’t seem to be a way to search through your tweets at the moment. Also, the service is very basic and does not seem to be 100% complete. For instance, there is a “restore” tab (for restoring Twitter accounts) yet it states that you cannot use this feature because the Twitter API does not allow it. Backupify is actually a better choice if you’re looking for something more feature-rich; it supports Twitter along with a handful of other services. The Archivist is a Windows desktop application that lets you “archive tweets for later data-mining and analysis.” You can search, save, export and visualize your tweets all with this efficient desktop tool. If you are a Mac user or just do not want to download the application, you can try out the Web version. With the Web interface you can view archives for any search term (keyword, username, hashtag, etc). You’re then presented with stylish, colorful charts and graphs that you can click on for a more in-depth view of how that term has been used on Twitter. Twistory definitely has a unique approach to Twitter archiving. With it you can “add your Twitter backlog feed to your favorite calendar application and browse through your personal Twitter diary.” Your Twitter account has to be public in order for Twistory to work. It’s is not just a great tool for archiving your tweets, it’s also an instant organizer since all of your tweets are displayed on the date that you created them. While Twistory also only backs up 3200 tweets, with a Twitter Pro account (coming soon) you can backup all of your tweets. By adding Twistory to your calendar, you can also search through them using your calendar’s search feature as well as have your archive automatically update on a regular basis. TweetScan calls itself “the most complete Twitter backup available.” You can choose to create a full archive or simply choose which items that you’d like to backup (tweets, friends, DMs, replies, followers, favorites). They say that only your last 1000 items will be downloaded from Twitter. You will then get a zip folder of your tweets to save to your computer. The zip folder contains your tweet in both CSV and HTML format. The HTML format is great because once it loads in your browser you can: search through your tweets; view your friends, followers, DMs and favorites; add notes and tags. TweetGuard was reviewed here at Blogging Tips a few months ago. It’s a free, handy tool that will backup your Twitter account on a daily basis. You can also export your data in CSV or XML format. Tweets, messages, favorites and friends are organized into tabs for easy viewing. You can also search through your tweets. TwitterBackup is a very simple tool that “downloads all your tweets and stores them in XML format. The document type is identical to Twitter’s API.” While I haven’t tried the tool myself, I have heard many positive reviews about it (as you can see from the comments on the linked page). Tweetbook is another unique tool that differs from the basic text archiving format. What Tweetbook does is generate a PDF eBook of your latest tweets, replies and favorites. 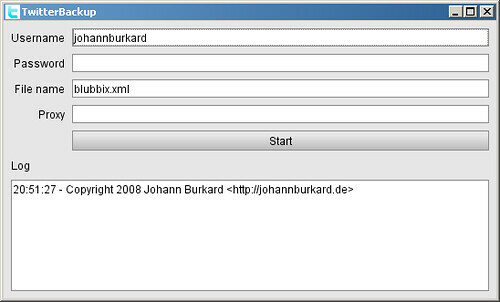 You can also choose to create an XML backup file as well. If you’re looking for another Twitter backup tool for creating PDF files, you may want to try MyTwebo. You can actually combine multiple Twitter users into a single PDF archive file. The service is also 100% free with unlimited backups and customization options. TweetSaver is your Twitter lifesaver; it archives your tweets along with your favorites. You can also search through and tag your tweets to make them easier to find. A unique feature that I found on TweetSaver is that they allow you to share your archived tweets on various social networks with the click of a button. TweetSaver does not have a free account type, but they do offer a 7-day free trial. There are four accounts to choose from: monthly $5.00; yearly $30.00; TweetBlast-monthly $3.00; TweetBlast-yearly $15.00. To learn more about the differences between each plan be sure to check out their pricing page. If those aren’t enough or you still have found the perfect tool, here are 8 more options available for archiving your tweets and Twitter data.